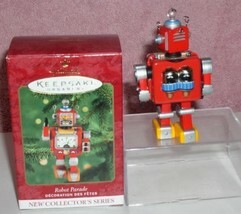 Robot Parade sculpted by Nello by Hallmark Keepsake ornament Description Robot Parade sculpted by Nello by Hallmark Keepsake ornament. This ornament is Dated 2000, approximate size: 4 inches tall. 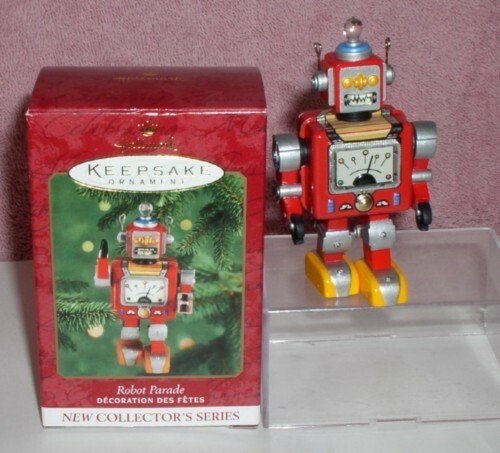 this ornament is in excellent condition and in the original box. This picture does not do this item any justice at all. Remember I am here for you at any time and I am very happy to answer any of your questions. This item comes to you from a smoke free home. Check out sellers other great bargins this week. This picture does not do this item any justice at all must by it to see for your self Good luck with your bid and I hope you win. International Buyers – Please Note: new rules at requires me to add this to my listing • Import duties, taxes and charges are not included in the item price or shipping charges. These charges are the buyer's responsibility. Other information a seller may wish to include: • These charges are normally collected by the delivering freight (shipping) company or when you pick the item up – do not confuse them for additional shipping charges. • We do not mark merchandise values below value - US and International government regulations prohibit such behavior. If you have any questions regarding this matter please feel free to email me though ask seller a question. I am here for you any time I care about making you happy. Payment and Shipping Info are in USA Dollars and these amounts are for USA residents only. Shipping outside of the USA will be more. Email seller for cost if you are outside. Payment Options Paypal payments required as per rules. 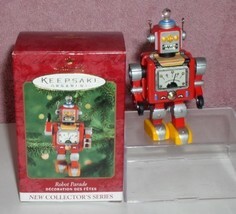 I will only ship to paypals provided mailing address. If you want something different contact me to work this out. Seller offers a Lay A Way Plan, term to be worked out between buyer and seller at the close of thesale. I would like to get 25% non refundable deposit and the balance to be arranged to fit your pocket book. Please email me with any of your needs or special requests I am here for you. Shipping/Handling 0.00 Delivery Conformation is included for USA buyers is included in S H cost listed here. Shipping outside of the US will be more. INTERNATIONAL S H Rate There is no item that I can ship Internationally for free. If the item ends with a free shipping charge please give me a chance to send you an invoice from with the proper shipping cost. Do not pay the invoice if the invoice says free shipping if you are outside the USA. Shipping Options FedEx - ups ground - usps priority mail, first class, parcel post Mail the shipping cost listed for USA buyer applies to s h cost listed here at sellers choice. I ship many different sized items and I use different methods for different item or items. Sales Tax 7% for Florida in-state buyers please add the tax to the total Terms All payment are expected to be received 7 days if you need an extention I will be happy to let you have it I just need to know. Please free to ask any questions before you bid. The item you will receive is exactly what is described above. Please read what you are buying if not sure ask questions. . Do not read into anything title, discription and picture should match. If it does not email me if there is a error in the listing I will fix it immediately I am only human. You will get what I have posted. PLEASE READ! Whensale ends I will send you an email telling you have won. If I do not hear from me please contact me. S H is required on all transactions. Except if free s h is offered to USA buyers. Delivery should be no latter then within 7-15 working days with in the USA. Large pieces they will take longer. I have Some Large pieces are professionally packed. The shipping time can take up to 10 working days to ship these pieces. You should receive them within 5-7 day from the date it is shipped. Please be patient when I ship these pieces. Each carrier has different rules. For these services you can check on line to find out where your package is in transit. If a package is lost your item will either be replaced if another one is in stock or refunded if stock is sold out. You will be protected against loss or damage if this should occur. If damage occurs please read I must be notified immediately within 24 hours of your receiving damaged item. I will hand it professionally for you . The post office does not loose item but if this should happen please read Post Office rules. For lost parcels, you must wait 21 days domestic and 45 days for International shipments. For shipments to Italy, you must wait 60 days. The post office rarely looses or damages packages. Please give time for your package to arrive. Do not worry about anything you are protected. Please be careful when your package arrives to unpack your package carefully. Suggestion open over a soft surface to avoid damaging your item. If a there should be a claim for either loss or damage the buyer will be required to fully cooperate with the seller to and provide the proper documentation and paper work that would be required to file a claim for loss or damaged. Paper work must be done in a timely manner. I should receive all documents requested within 3-5 working days. International Shipments additional processing time; they need to be manually taken to the Post Office. • Sometimes shipping time may take longer than normal. Sometimes packages are held in Customs for a variety of reasons. Please be patient. Packages are not considered lost until 45 days after the package has been shipped. At the request of buyer or for some countries registered mail may required/or requested at buyer’s expense. All buyer USA and International please 1. Please read what you are buying if not sure ask questions. Do not read anything into this listed that I do not say! The Title, Description and Picture should match. If it does not email me if there is an error in the listing I will fix it immediately I am only human. You will get what I have posted. Shipping Time I ship within 3 working days of your payment clearing and in most cases I ship sooner. I just give myself a 3 working day window in case of emergencies on my end. The 3 working days THIS DOES NOT APPLY TO large pieces. I tell you the worst and give you my best. If a package is delayed you will know why if the problem is on my end. This way you are never disappointed in my shipping time. I really try hard to do my best. Shipping cost are stated here for USA buyers in all mysales and I know that I ship quickly (international buyers please email me for s h cost). Each package I ship there is handling cost added to the cost of actual shipping. I have a varied inventory and this makes handling fees vary. For example: The handling fee for a pin would be different then sending for a collectible, art work etc. Some packages require more supplies which have become very costly we try and cut corners as best we can but every day we are faced with more expenses. Some of my packages are packed and shipped by a privately owned packing house. These packages take longer to prepare for shipment I have no control when they will ship I will email you as soon as they ship. Shipping time will take longer than normal on large pieces I have professionally packed. 3. Shipping Time I ship within 3 working days of your payment clearing and in most cases I ship sooner. I just give myself a 3 working day window in case of emergencies on my end. The 3 working days THIS DOES NOT APPLY TO large pieces. I tell you the worst and give you my best. If a package is delayed you will know why if the problem is on my end. This way you are never disappointed in my shipping time. I really try hard to do my best. 4. Shipping notices I send out I send out direct emails to you when I have either processed or shipped your package and give you the shipping date in this email for all post office shipments along with delivery conformation numbers USA buyers, for international buyers you will have the CJ, LC or LN numbers come in this email. Some emails have not been accepted by some email spam filters. I also try to send you an email though my that notice not will not show the actual date of the shipment and will just say that your package has been shipped. For the expensive or bulky item such as some toys, collectibles, art work etc I use DHL, FedEx or UPS. Some emails from my may not come with tracking numbers when I use these services. If you want them email me for them and I will be happy to email them to you. I do not ship over the weekends. 5. Shipping Time Remember I have no control over shipping delays once I have shipped out your package. I try to please everyone but sometimes this is an impossible task I hope that I meet your full expectations and you are happy with my service. If I do not please tell me where I can improve. Remember I am only human! You are buying from someone who cares and you can trust You can see by over 12,100 positives that I already have . ******* Good luck with your bid and I hope you win. . Do you want to be notified of my sales and specials? Be sure to sign up for my Email service for new listings and add me to your Favorites List! Click Here. Double your traffic. Get Vendio Gallery - Now FREE! If you have any questions about this item feel free to call me at your convince at 305-661-4368 I am here for you to help you. If you have any questions about this item and you want to call me I am here for you any time: Please call me at 305-661-4368.